A coastal themed living room evokes memories of sandy beaches, the sky meeting the sea and the laid-back vibe of the seaside making most of us to want summer to never end. While this idea might be far-fetched especially for those who live in countries with temperate climates, we can easily keep the illusion of summer and beaches right into our home. Coastal-themed spaces, beach cottage style, or simply, cottage style spaces, evoke a very casual and laid-back feel which helps keep a relaxing and comfortable environment. Spaces look cozy, inviting and always feels like there’s a personal touch to it. Below we share some of our best coastal themed living room designs so you can get ideas for implementing these ideas in your own interior design. Simply combining accents of green and blue to the neutral-colored pieces already gives the living room above a coastal look. The muted turquoise and slate blue tones adds a soft & subdued coastal feel to the space, which is further emphasized by the use of textured materials such as linen fabric, jute rug and natural wood finish. The accent color selection gives this room a bright and fresh appeal, which is easy on the eyes. Bold stripes – you would often encounter bold stripes of blue and white (in different varieties of blue) in coastal-themed spaces. It gives that very youthful and casual feel to it, as it is reminiscent of umbrellas and beach blankets. Slipcovers on furniture pieces – if not already upholstered in a linen fabric, furniture pieces are then often covered in slipcovers. Commonly-used colors are white, beige and taupe. Bright-colored accents – as cottage-style spaces are usually white or neutral-colored, few accent pieces with bright colors are used to give more life and a more youthful vibe to the space. Commonly used colors are turquoise, teal, and various shades of blue and green. Fun accent pillows – pillows used not only come in bright, solid colors, but also in fun & bold prints. You would often encounter batik designs, Moroccan style patterns, and even simple geometries and classic patterns. Sea-inspired accessories – it is not surprising to find shells, white corals, sea-related art and boat scale models on coastal-themed spaces. Throws – throws are used to accessorize the sofas, giving it a more casual and laid-back feel. They come in a variety of materials and textures, and can easily give your living room a “lived in” feel. These elements may or may not all be found in a coastal-themed living space. 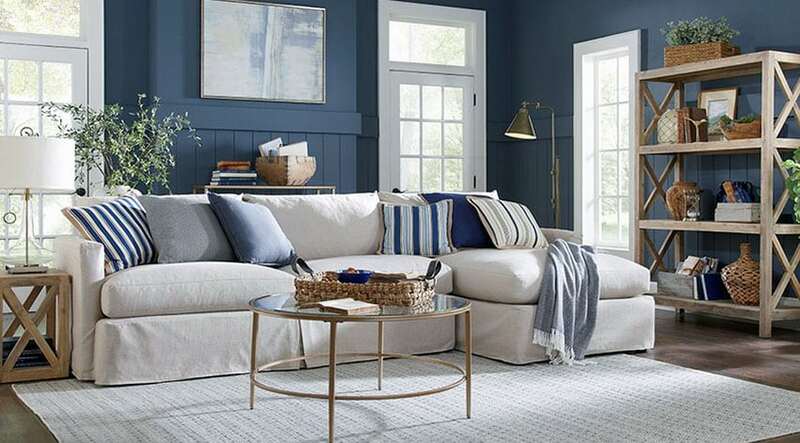 When it comes to transforming your current living room to a cottage-inspired living room, always consider the existing colors, finishes, accessories, and decide how bold you’re going to be with your transformation. Just have fun mixing and matching different patterns and materials in order to achieve the perfect combination for your space. Below are some excellent references for coastal-themed living spaces which could be an inspiration for your future cottage-style room. This design goes for a more nautical color scheme, using deep blue and clean whites. The living space is framed with a large dark blue area rug, making the white linen fabric of the furniture pieces really stand-out. To add a more fun appeal to the white furniture pieces, a variety of blue pillows with some yellow pillows were added as accent, creating a balanced look. 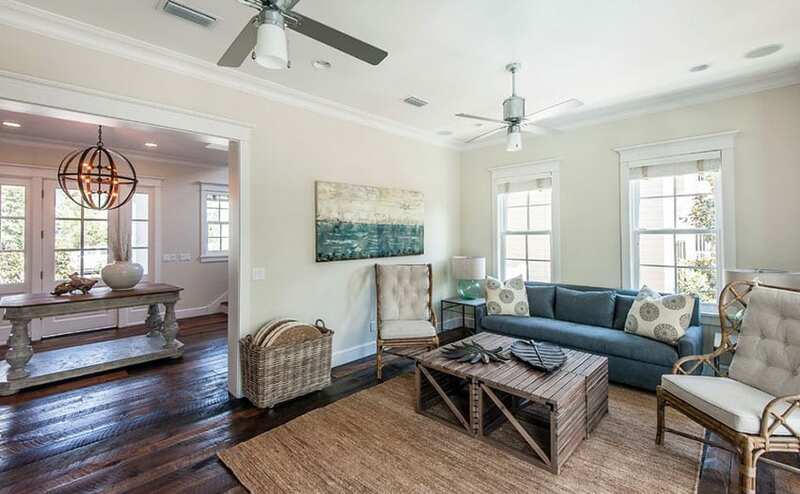 By combining different essential elements of beach cottage style, this living room is a able to achieve a very well-rounded coastal-themed space, with just the right amount of rustic feel to it. Horizontal wood panels and bricks on the walls were painted over with white for a more uniform finish, yet allowing its original texture to come through. Antique paint finishes were used on wooden furniture, while some accent pieces of turquoise and light blue were used to bring in that coastal feel. 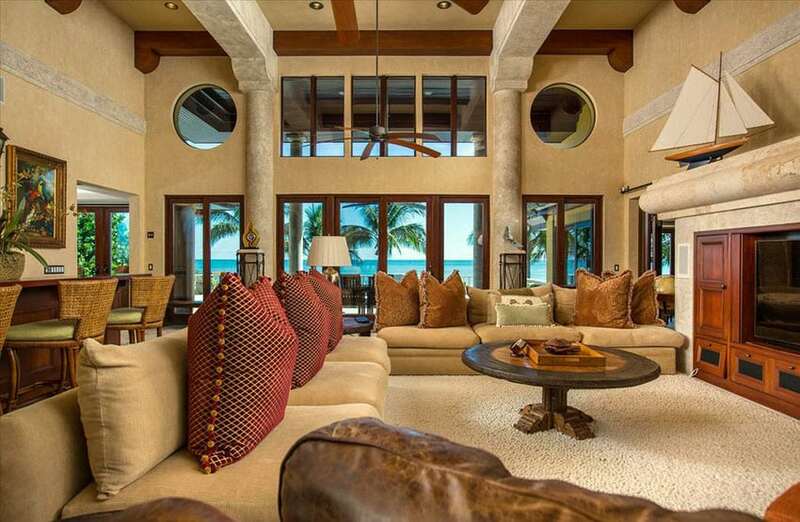 Subtlety is the key for this gorgeous formal living area. 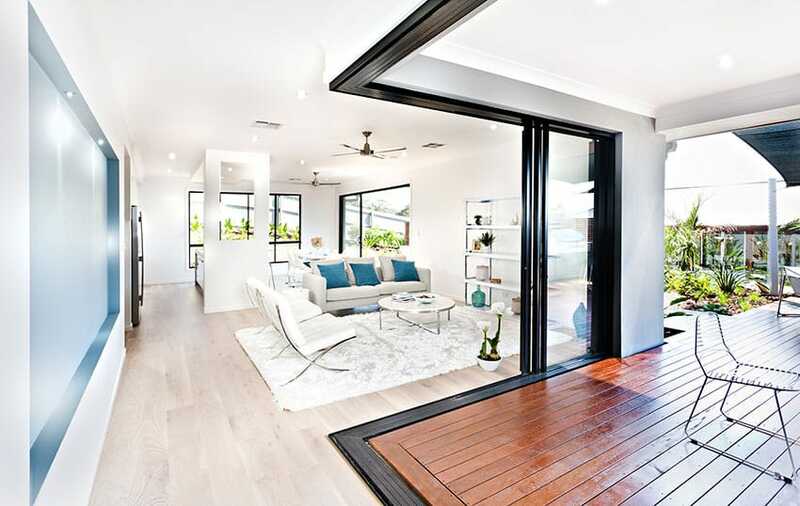 Its high ceiling and large windows allows better ventilation and gives the space a light & airy feel to it. The walls were painted in a soft oatmeal color, while the furniture pieces are upholstered in a soft taupe shade. The accent colors used were very light and understated, creating a very elegant appeal to the space. Light teal accessories and light powder blue patterns on pillows were used, instead of solid colored pillows, so that it simply blends nicely with the rest of the pieces. Going for a more casual & rustic look, this living area uses a bold dark blue sofa as the main accent furniture piece, which means the rest of the pieces get to use a more neutral/understated color. Light cream walls adds a bright, youthful feel to the space, while the jute rug, rattan armchairs and the wood crate coffee table add a natural rustic coastal feel to it. 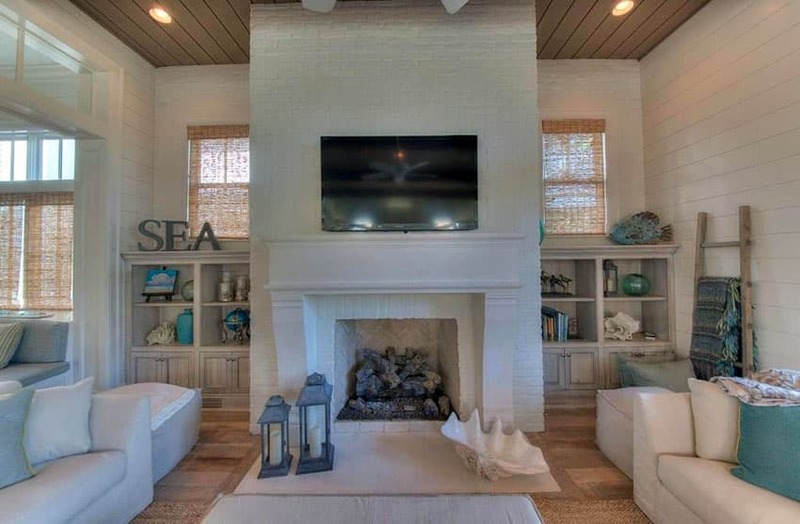 This is a great example of a very subtle way to inject a nautical theme to your living room. This small space keeps a very neutral color palette – taupe walls, white chairs and rustic wood flooring, and adds just enough nautical elements to bring in the sea into the space. 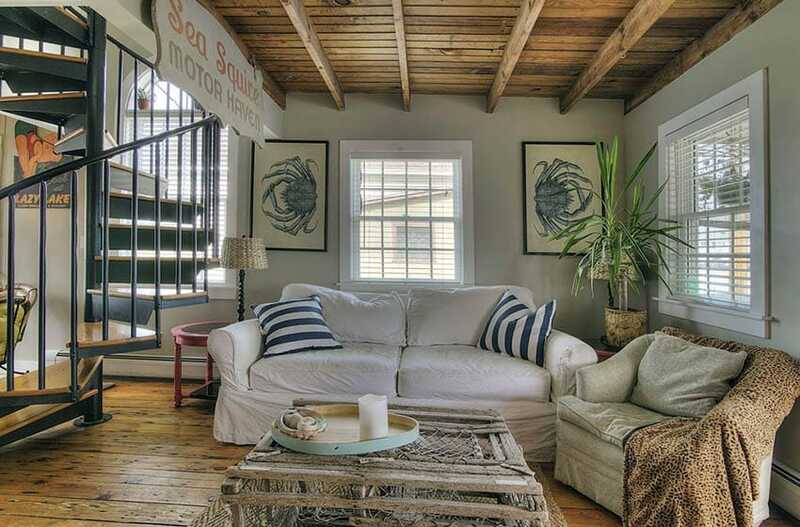 Some of these are the white & blue striped pillows, the rope details on the crate coffee table, the conch shell accessories and the blue crab art on the walls. If your interiors are mainly white or neutral-colored, then transitioning it into a coastal-themed haven is very easy. In this example, you would see that main finishes and furniture pieces uses basic white or beige colors. 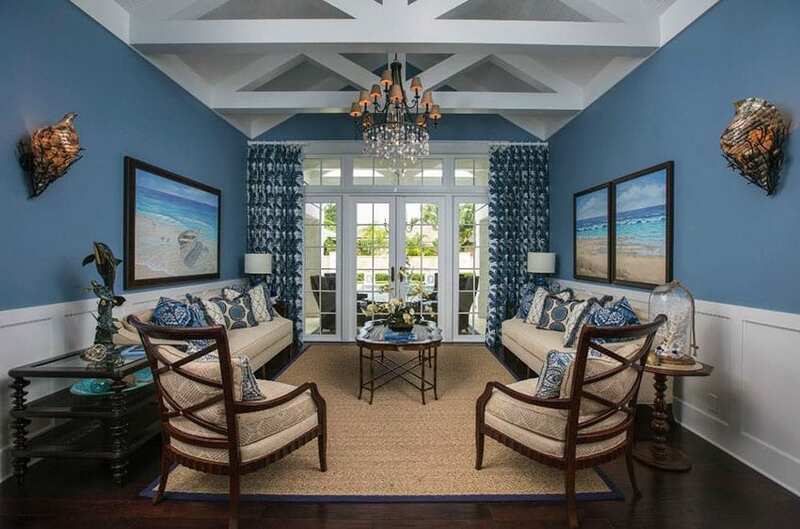 In this case, all that is left was adding blue accent pieces to complete the coastal feel. Different turquoise pillow designs and art pieces were placed, giving it a brighter, summery feel. 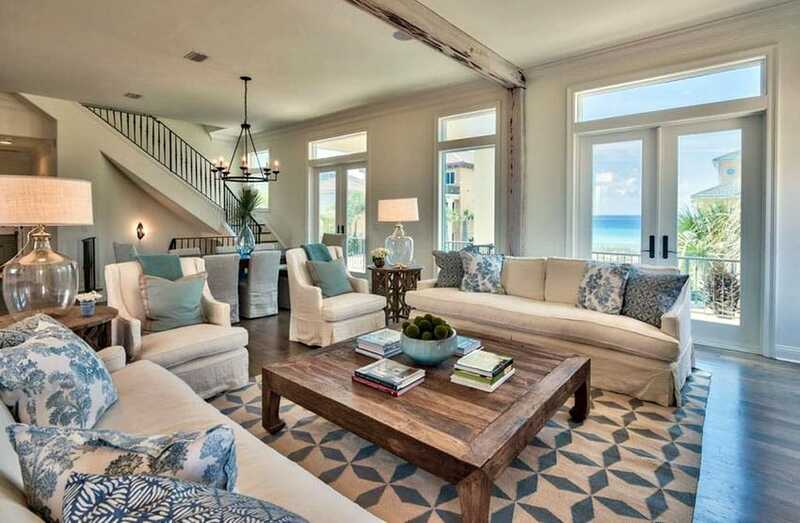 This is another great example of a low-key coastal themed space. The basic finishes and elements are mostly neutral-colored like the beige walls and white furniture pieces, with added touch of rustic wood and rattan furniture pieces. 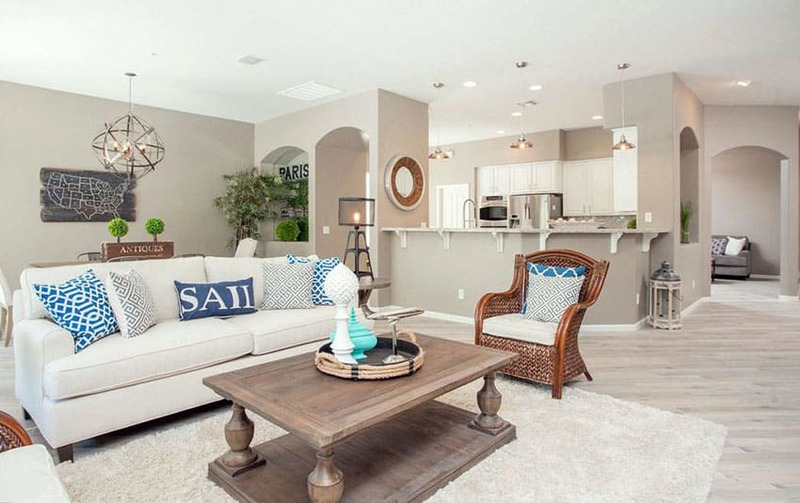 Accent pillows of of blue and white as well as nautical-themed accessories already gives the space a more coastal look. Previous examples mostly use blue & white to inject that coastal vibe to the space, but this example keeps a neutral palette, while still introducing a coastal themed design. The natural jute rug and the antique storage box already gives the space a rustic coastal vibe, while subtle batik patterns and linen fabric used on the pillows & furniture pieces helps emphasize them further. 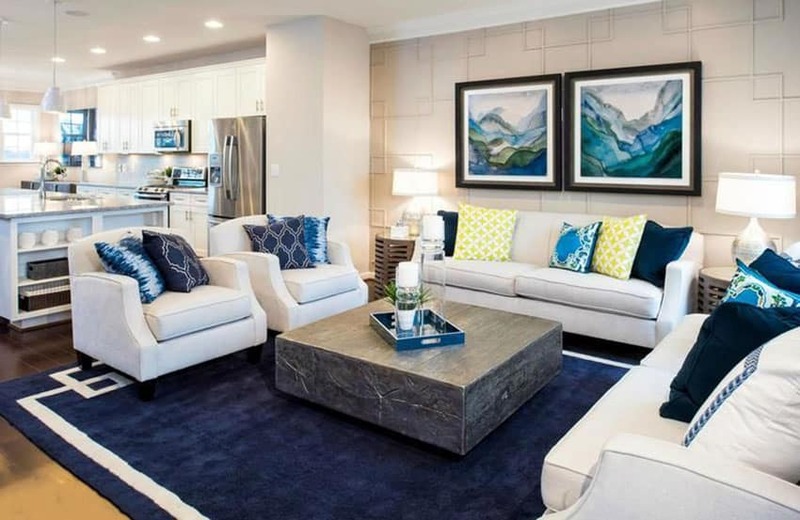 Instead of accent pieces, the blues in this casual living area is found on the walls, wherein it was painted in a light blue color, creating a fresh background which is easy on the eyes. The rest of the interiors mainly uses white, such as the linen fabric on the chairs & the built-in pieces, and then adds a couple of rustic-finished pieces such as the console table, coffee table and the jute rug. The view from this living room already adds enough blues into this space, so only a little is needed to make this space coastal-themed. The all-white living area looks bright and refreshing, with only blue throws as accents to complete the look. Adding a water feature into your design is also a great way to give a coastal feel to any space. 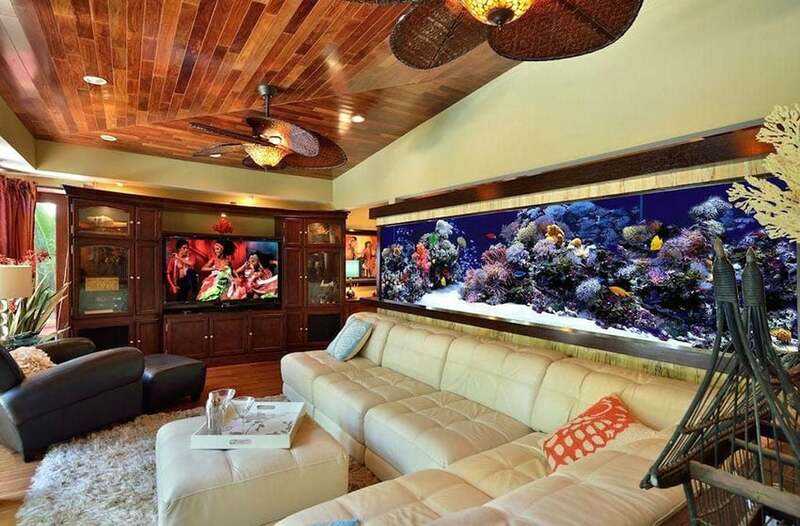 This living room keeps a classic Mahogany and white transitional design style, and adds a large built-in salt-water aquarium into the wall feature to add natural accent colors coming from the corals and fishes inside the tank. 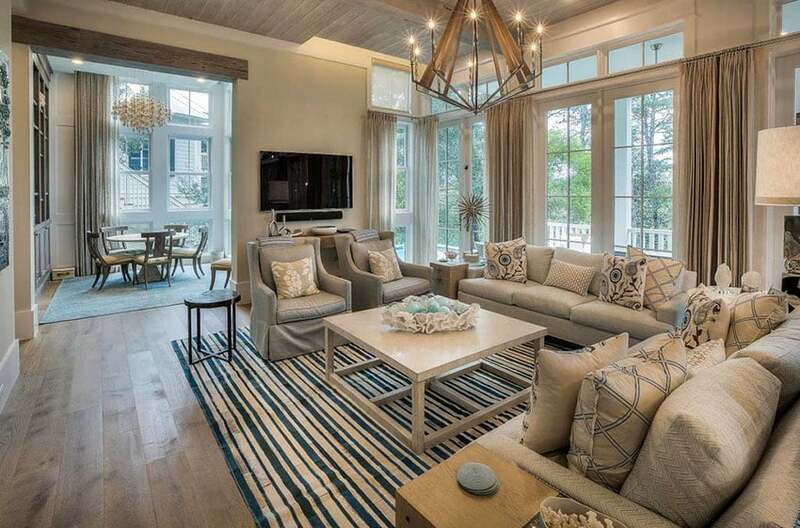 Another excellent example of using neutral color to create a coastal living room, this living area boasts of a high ceiling, large windows and a scene-stopping view of the sea, adding a vibrant blue color to the neutral-colored space. The space is elegantly furnished with large, cozy sofas upholstered in beige linen fabric with accents of red and brown pillows. You will also see antique wood pieces and rattan bar stools, as well as nautical-themed accessories such as the boat scale model and some sea-inspired sculptures. 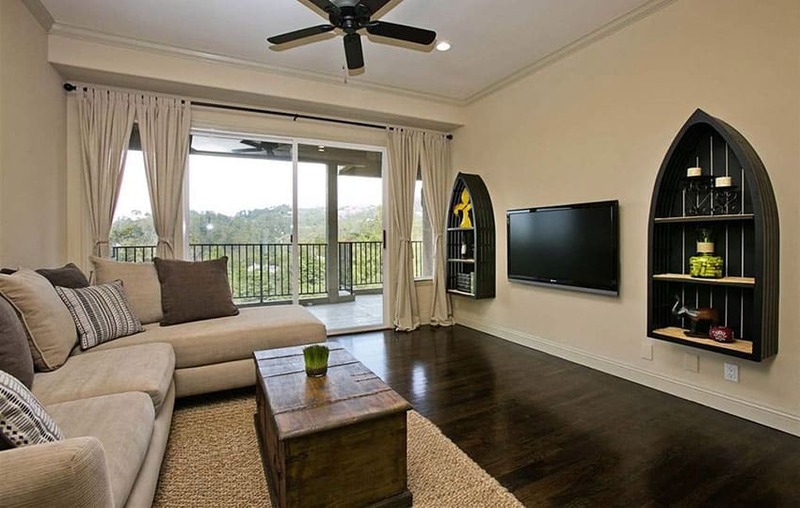 Steel blue wall paint gives this casual coastal-themed living space a sombre and masculine feel. The dark-colored walls make the linen sofa stand-out, as well as the white-framed doors and windows. It also helps balance out the variety of finishes found in the space such as the woven rattan baskets, trays and cases, antique wood finish, as well as metal. White interiors can easily be transformed into a more coastal-themed space by simply adding the correct colors and accessories to the space. 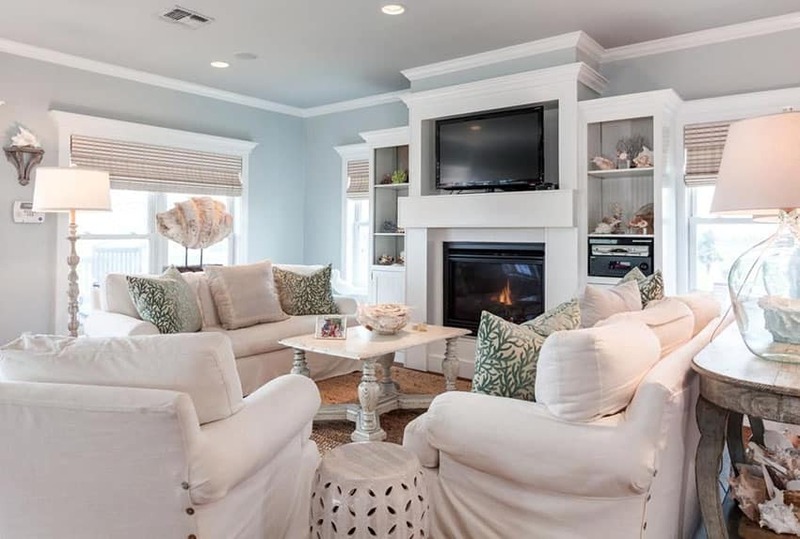 In this case, teal pillows were added as accents to the beige linen sofa, along with more subtle blue accessories, giving it a very subdued coastal look. 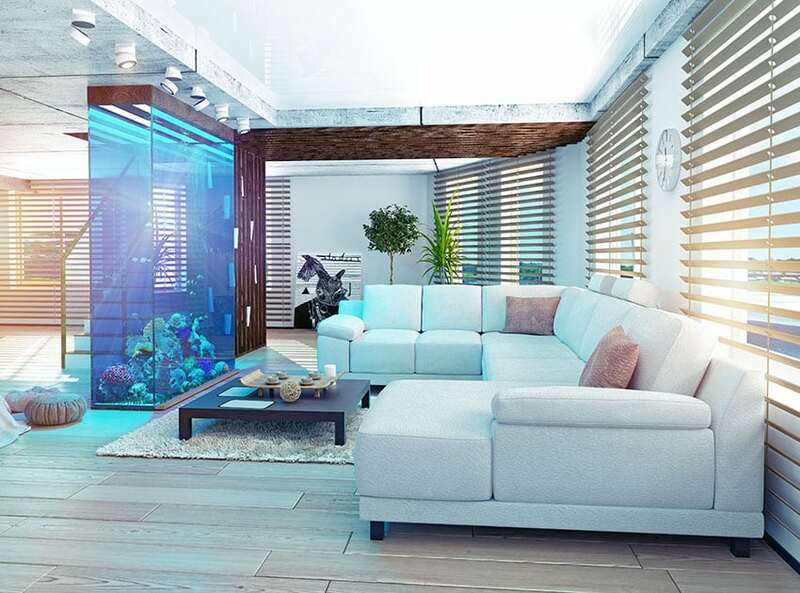 The large floor to ceiling-height seawater aquarium already brings the seaside vibe into the simple modern interiors. The living room keeps a simple and neutral color scheme of pine wood floors and blinds combined with white walls and sectional sofa, with a few accents of greens from the indoor plants, adding more natural elements into the space. A more rugged, shabby chic feel is achieved in this casual living area, as it is filled with coastal-themed accessories and knickknacks, giving it a very “lived in” feel. Just like most coastal-themed spaces, the foundation of this design is mainly white surfaces & linen-upholstered furniture pieces. A few wooden pieces were added for a more rustic vibe, and accessories such as the numerous variety of shells and rattan baskets found in this design. Even classic empire style spaces can be transformed into a coastal-themed living area by just changing up a few pieces and adding textures. In this example, the wall was painted with a gorgeous slate blue color, matching the blue shade used in most of the accent pillows. Accessories and sculptures with a coastal/sea-inspired subjects were also used to complete the design such as the dolphin & turtle sculpture, the glass bell with white coral, and the sea paintings on the walls. A modern eclectic space with a touch of coastal themed living room theme, this interior design focuses on simple finishes with prominent textures such as linen fabrics, solid wood furniture pieces and deep blue accents, helping bring in the seaside feel similar to the view in the balcony.